Rubber processing machines are designed to provide effective working for most elastomer and polymer compounds at an optimum level. These machines are engineered to score over the conventional mills in terms of higher efficiency and improved machine life. Almost every machine has anti-friction roller bearings, which result in a substantial reduction in power consumption. The machines are available in standard as well as customized specifications. 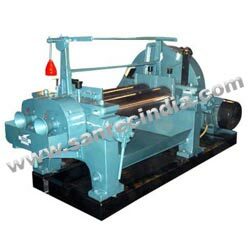 Rubber processing machines have proved to be the most economical for rubber from the beginning of rubber processing. All machines are equipped with advance features which improve the efficiency.